It is once again the sign up season for the International Hemp Association. The invitation posted below was sent out today to prospective members and we thought that it would be appropriate to extend this invitation to all of you as well. You can get the Journal of Industrial Hemp directly from Haworth Press, but we at The Hemp Report encourage people and companies to join this important organization directly and get the Journal as one of the many benefits. We would like to take this opportunity to formally invite you to join the International Hemp Association (IHA) and subscribe to our official publication the "Journal of Industrial Hemp" (JIH) at a discount of 15–35%. The IHA is a member-supported, non-profit educational organization dedicated to the advancement of Cannabis through the dissemination of information. In support of this goal the IHA in Amsterdam and Haworth Press in New York publish the JIH twice annually. The JIH contains peer-reviewed scientific and popular articles concerning legal uses of Cannabis. We welcome submissions from a wide range of disciplines such as agronomy, chemistry, ecology, economics and markets, history, ethnology, geography, genetic resources and breeding, physiology, phytopathology, applications and product development, appropriate technology, hemp collectables and current events. We also include conference announcements and reviews, book reviews, museum and regional reports. The JIH is a forum for expanded discussions of scientific topics not available in other journals today. Some authors may wish to publish initially in specialty journals, but definitive review articles and original research with expanded results are particularly welcomed by the JIH. The first "Journal of Industrial Hemp" of 2006 (Volume 11, Number 1) will feature peer-reviewed articles on fibre hemp agronomy and variety trials. Results presented in "Hemp and flax biomass and fibre production and linseed yield in irrigated Mediterranean conditions" by Jaume Lloveras, Francisca Santiver and Gil Gorchs suggest that in the irrigated conditions of the Ebro Valley, Spain hemp seems a more appropriate crop than flax for the pulp paper industry, although in order to obtain higher yields earlier sowing and longer cycle varieties should be studied. "Hemp (Cannabis sativa L.) trials in southern Sweden 1999-2001" by B. Svennerstedt and G. Svensson presents results from the first fibre hemp experiments carried out in Sweden since the 1960s. Results from hemp experiments in European countries indicate that long day conditions may be beneficial for the fibre content and quality of hemp. The long day conditions during summer in Sweden are therefore of interest. Robert C. Clarke summarizes the history of hemp cultivation and traditional use in the Republic of Korea and investigates the cultivation and processing techniques currently being employed to produce hemp ribbon and seed and weave hemp textiles. Comparisons are also drawn to hemp production in Europe, China and Vietnam. In the Collections Corner column, Don E Wirtshafter describes a fascinating "Hemp for Victory Era" salesman’s kit that includes many samples of American hemp products of historical research interest; while The Wide Wild World of Hemp column presents a recent history of the hempen apparel industry by Kenyon Gibson. Drs. John M. McPartland and Karl W. Hillig host the "Cannabis clinic" column featuring a series of color photos of fungus morphology and symptoms of the white leaf spot fungus as well as suggesting methods of control. "Hemp Foods in North America: Status and Joint Industry Research" by Gero Leson summarizes past and present hemp seed production in Canada and describes the Canadian Hemp Trade Alliance (CHTA) with their overall joint R&D agenda. Robert C. Clarke takes us on a tour highlighting three local museums in northern Nagano Prefecture, Japan that feature comprehensive displays of hemp cultivation and processing and also reviews "Cannabis Britannica" by James H. Mills. Franjo Grotenhermen reviews "The Medical Uses of Cannabis and Cannabinoids" edited by G.W. Guy, B. Whittle and P. Robson. Don’t miss out on your copy. Subscribe today! The IHA is a member service organization staffed by volunteers. We try to answer all requests for Cannabis information. However, we always attend to the needs of our members first. It is now time to join the IHA for 2006. We encourage JIH subscribers to also join the IHA and receive the additional satisfaction of supporting Cannabis education. Membership fees are used to pay for journals and support office expenses. In addition, IHA members receive a substantial discount over direct subscribers. Businesses should join as sustaining members and will be listed under their business name in our membership directory, available upon request. Contact David Watson and Janet Erisman at iha@euronet.nl for additional membership information. Libraries and agencies should contact Haworth Press directly to enquire about rates. The JIH will begin Volume 11 in 2006. JIH back issues are not posted on the web. However, the first six volumes (12 issues) of the "Journal of the International Hemp Association" JIHA can be viewed by going to: http://mojo.calyx.net./~olsen/HEMP/IHA/iha.html or by searching for "International Hemp Association" at Google.com. through the dissemination of information." Twenty years ago, before the Fairmont bought the Sonoma Mission Inn, I was the head line cook at the The Big 3 restaurant. 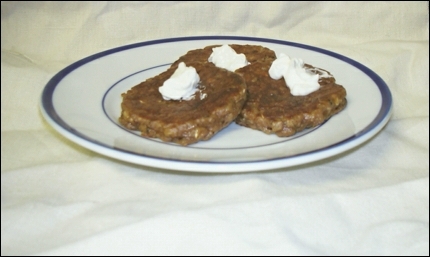 The hotel general manager went on vacation to Oregon and brought back this recipe for Apple Oat Cakes. We made it and it was wonderful, but only on the first day. The second day the cakes were flat, did not rise and were pretty gummy - not high end restaurant fare. As I sped home through the vineyards to Berkeley I thought back to my days in the Culinary Arts Department at Contra Costa College and the answer came to me. Driving with the top off is good for things like that. It was the double acting baking powder! It acts one when it gets wet and once when it gets hot. Add it to a hot, wet batter and its done for. So, the next day we made a batch of Apple Oat Cake, but I left out the baking soda and baking powder. The next morning I mixed them in and made a test batch. They were as god as the first time, but would they hold up? The next morning we made another test batch and success! The Sous Chef made some house made crème fraîche and we were in business. They were so popular that our head waitress, Patsy, said that a number of her customers wanted the recipe. So, with management's permission I scaled down the 5 gallon recipe to a home sized batch. A few years ago after we moved I found the recipe in a box and I took out the wheat germ and added shelled hemp seed to it instead. Cover and remove from heat and let sit for 20 minutes. Put in a container and refrigerate overnight. And thin if necessary with 1-3 tablespoons of water. To cook: Ladle a little more than a quarter of a cup of batter onto a lightly oiled griddle at 350° F until the bubbles stay open on the top and the bottom is medium brown. You don't want the cakes to be wider than your pancake turner. Turn carefully and cook until brown on bottom and done through. Serve with sour cream, crème fraîche or Canadian maple syrup. Yields about twenty 3" cakes. Notes: Lightly wipe griddle with oil every time to prevent sticking. What can I do? When I am answering email and phone calls for The Hemp Report, Vote Hemp, or IndustrialHemp.net this is the most common question that I am asked. In my replies I point people to two of the lists that I have written. The most comprehensive is the What can I do? list that I wrote for Vote Hemp. Somewhat shorter is the list that I update regularly at IndustrialHemp.net. What it comes down to is that you need to buy and use hemp products on a daily basis. Some of the top selling and most widely available hemp products are Dr. Bronner's Magic Soaps, French Meadow Bakery's Healthy Hemp Sprouted Bread, Nature's Path Hemp Plus Granola and Hemp Plus Toaster Waffles, and Nutiva's Shelled Hemp Seed, Oil, and Protein Powder. Of course there are a lot more hemp products and more are coming to market every month. It's easy to find a lot of them, too. If you want to get even more involved in the world of hemp there is plenty to do and learn. Do you live in California? You could write your state representative a letter in support of AB 1147. It's a great bill and it has cleared its first hurdle: Assembly committee OKs bill letting farmers grow hemp. You could also Write Congress and ask your elected representative to support H.R. 3037. The bill, known as the Industrial Hemp Farming Act of 2005, already has nine Cosponsors. If your representative is one of them please take the time to write and thank them. 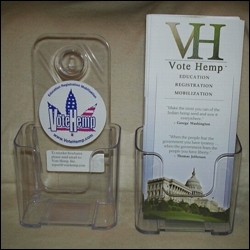 If you own a store that sells hemp products your could make a $21 donation to Vote Hemp and get a brochure holder and Vote Hemp brochures for an easy display. You could also join the Hemp Industries Association (HIA). You don't even need to be a hemp company to join the HIA. HIA members engage in hemp research, farming, processing, product development, manufacturing, distribution, marketing and education. You can even join as a supporting member. As you can see the is a lot to learn and a lot you can do. So, why not just get up and go do it?